Kula PTA wants to connect with you! 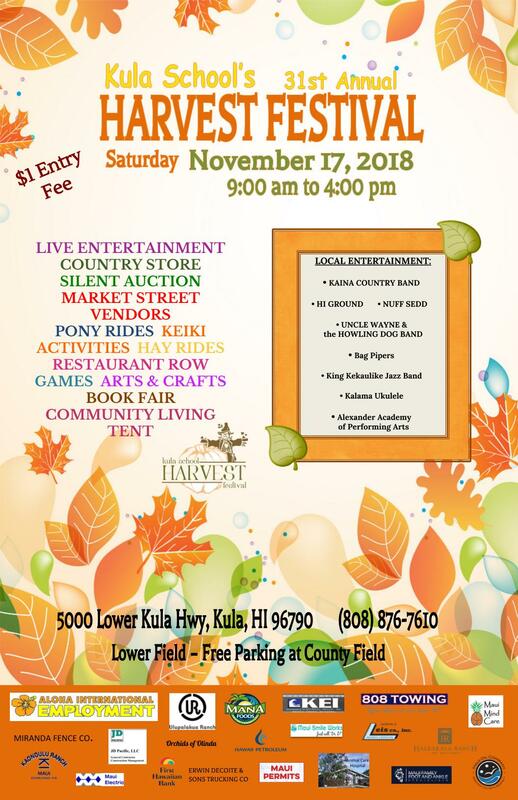 Kula School’s Parent Teacher Association is thrilled to host our 31st annual Harvest Festival fundraising event on Saturday, November 17, 2018, from 9:00am-4:00pm. Once again, this much anticipated event is being held on the lower field of our beautiful school campus. Volunteers from our Parent Teacher Association (PTA) and school community, organize the Harvest Festival. It is Kula schools largest fundraiser, and monies raised from this event are used to provide programs such as Physical Education, Art, and Music, which they otherwise would not have. Additionally, funds raised also support classroom needs in each grade level as well as assist with various student activities not paid for by Government funding. Our PTA is a 501 c (3) nonprofit organization so your donations are tax deductible. We humbly ask for your continued support of our students by becoming a corporate sponsor, or making a donation to our Silent Auction. With your donation, you will be making a tax-deductible contribution that will help our school provide our students with the extra opportunities to excel in their education. With help and dedication from our parents, numerous volunteers and community friends such as you, we will once again be able to make this year’s Harvest Festival Fundraiser a success. On behalf of all the Kula School children, we thank you in advance for your contributions and support. ​Chair name/phone number list below.